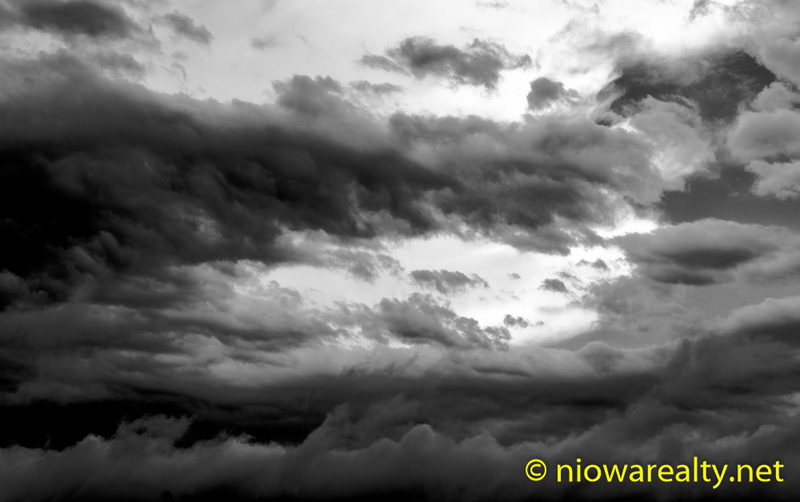 Share the post "Dark Clouds"
Some days are simply those we want to have ended and never to be remembered. My morning started out as just about every other morning by getting my day organized and filling in blank time slots with other things to do. Since having learned long ago that being in and out of one’s e-mail many times during the day is not only time consuming but also counter-productive, I usually only go into my office e-mail account no more than two or three times a day unless I’m expecting something pressing or important. After re-reading an e-mail this morning, I was a tiny bit hurt by a few words written by someone I’d met but only a few days ago. The pulse of that message told me I must have innocently crossed a barrier and likely created a rift by simply asking a question at that meeting about a familial connection because I remembered the last name from years past. Since most don’t realize I’m not a gossip nor dredge up past experiences and pass them about at every street corner, this person likely took my simple question as a personal affront. It’s unfortunate, but that’s the way many in society react when someone innocently mentions relationship. I’ll not forget as long as I live a question I passingly asked one in business, and that was if he/she was from the family I knew of when I was very young. Oh my goodness did he/she get exceptionally sharp with me for even asking the question. I’ve come to the conclusion that some who believe they’ve risen so high in society to where they consider themselves dis-connected from their past, even the slightest mention of familial relationship with them will cause an inward and sometimes outward bristling. It’s unfortunate because no matter what anyone says, all families have colorful members who sometimes create embarrassments, but it all must be kept in perspective when realizing embarrassments do happen in all families. By the end of the day, I would say my patience with a few was being stretched to the limits by two separate buyers not showing up at homes I was to meet them at without having the common courtesy to call and cancel, as well as important messages left for several who didn’t seem to want to bother calling back until after hours this evening. And by the way, I’m still waiting for the return call that I placed days ago to a woman who left a message who insistingly said she needed to talk to me. If it was so urgent for me to call, then why now the dismissal by not returning my call? It must’ve been one of those rare days when the alignment of the sun, moon, planets and stars created some sort of discord with many. Even at the hardware store today a clerk was saying things to me that should have been questions instead of statements. All I’m glad about at this point of the day, is that it’s nearly over, and tomorrow will be a better, warmer, and brighter day. It always seems to happen when bad days occur once in a while and the following day is counter-balanced by all the better. The swing of the pendulum of positive vs. negative is OK and always that way, but I’d prefer the swings not be so great. The code of the universe has always been about balance and counter-balance. My one bright ray of hope was setting an appointment later this week to show one of my new listings which I have a “feeling” the buyers are going to be excited about. With that said, with so many dark clouds above, there’ll always be the sun waiting.